Burning Man is just around the corner and Burners everywhere are gearing up to make the long pilgrimage in the final days of August to the dried lakebed that waits about 10 miles outside Gerlach, Nevada. Among the most excited for this trip are the Fire Dancers and Fire Performers of Burning Man. Every year hundreds band together in groups of all sizes to film an audition reel that is sent in to be evaluated and hopefully approved by the first Fire Dancer at Burning Man and one of the original goddesses of our time, the Crimson Rose. With the help of her Fire Conclave Council she decides which of these fire groups will be admitted to the sacred space that encircles the Man in his final moments this space, also known as the Great Circle. From within this inner sanctum a grandiose procession takes place where those who have been admitted to wield fire in ceremony (the Fire Conclave) put on a scorching display that is revered within the Burner community as both performance and prayer. Together these fire dancers float across the sand wielding a variety of flaming tools. Sometimes it’s a sword, other performers use whips or a bow staff. A lot of performers use poi, which are essentially fireballs with short tethers attached. One time I even saw a guy with a flaming bicycle tire. 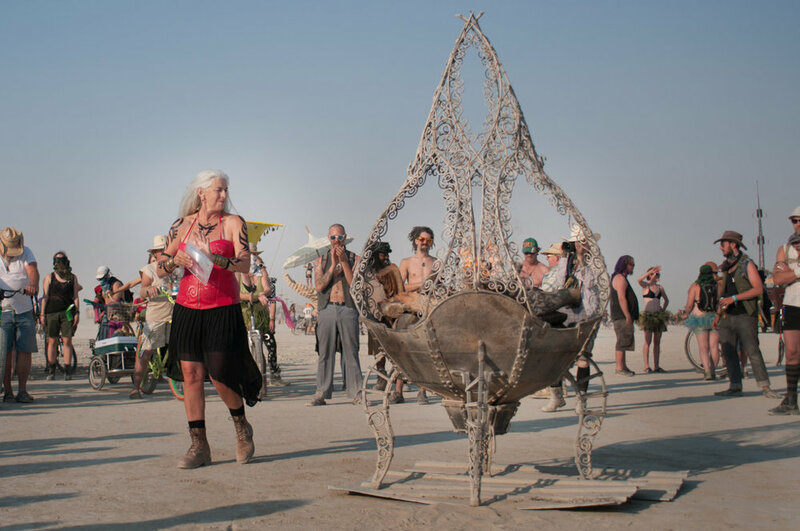 With all that imagination and the boundless creativity that comes with it at Burning Man I had to learn more about (what I consider to be) the fiery core of performance in the Burning Man community. To do this, I caught up with Crimson Rose who graciously took some time to share a bit about what she looks for in the fire dancers of the Conclave. Here’s what she had to say. “One thing that is actually very basic is theme. And some of the groups that have been very successful, do it over and over. And sometimes a group can get mired down for having a too complex theme. Because the audience really is not going to know what a group is doing. And the dance has to translate. You may think well I’m the queen of my fire kingdom and I’m walking with my fire dog. The audience is not going to know that. It has to be something that is subconscious. It’s the movement. It’s the playing with fire. It’s how a group works together. You know, do they work with movement well? Do they utilize the space well? Does the dance moves contract? Do they expand? Do they have a really nice formation of how the group works together? Is there fire on the stage all the time? Is there dead spots? Do they enjoy themselves? Are they scared? Are they afraid they are going to mess up? Which tells me they’re not comfortable with fire. Do they have a good support team? Do they have a good support team of fire safety around them that will help them? Is there drama within the group? Do they work together? And are they interesting to watch? Do they get excited about participating and watching others play with fire or are they copying somebody else’s movements because it’s easy to do that or are they just not excited about what they’re doing?” From this part of our talk I learned that when your movements tell a story, showmanship matters. Crimson explained, that sometimes people will videotape themselves with the microphone on. “And I remember one, very long time ago, where somebody was talking into it trying to pick somebody else up next to them while the footage was being shot. Which was like really kind of strange. So it’s [important that they are] being conscious of what they’re doing.” Remember, we’re showing off some choreography “And it’s also not just about the dance. It’s about teamwork too”. The FC Council knows that with successful teamwork comes progress, but that takes some trust, patience and a lot of communication. What Should Other Events be Learning from Fire Safety Models at Burning Man? Noticing that some events (like festivals) offer fire performance and others do not I wondered how the performance community is responding to fire given all the fears about safety that surely must come up. Every so often at concerts, pyrotechnic failures or other accidents make introducing fire arts a heated conversation. Crimson pointed out that “When things like that come out, the authorities always get nervous.” She explained. “Right now, I think one of the things that is really successful about Burning Man and why we’re able to do the things that we do not just with fire dance but with fire art. And you know, illuminating arts whether it’s pyrotechnics or something else is that we are so conscious about safety. Even though it makes it so chaotic, safety is always held above it. And we really pride ourselves on that, you know, we want to make sure that our record stands for itself.” Perhaps it will be through observing the respect that Burners have for fire when they become involved in festival production that the lessons found in fire dance may eventually be shared. The community and the leaders in it know that like the char left behind after a flame, any damage that occurs while someone was careless cannot be undone. As keepers of the flame Tabasco, Wrangler, Scorch and Crimson work together to ensure the use of fire is safe because “once we start messing up, once we are not on top of our game, then fire will be eliminated.” In this way, the same pyromania that draws people to fire is also why it commands respect. That doesn’t mean letting someone take unnecessary risks though. Instead the council tends to offer a learning experience by reducing the risks. Crimson told me that in one such instance, Dave X who manages F.A.S.T. had someone approach him with the burning desire to light his bike on fire – but this mans creativity didn’t stop there. “First, he wanted to light his bike on fire. And then he wanted to be on fire. Then he wanted to ride over this obstacle on fire, so Dave X knew this was really a lot of trouble.” Dave knew that what he had on his hands was a fiery disaster waiting to happen, but he chose not to shut him down. Indeed, that human drive to push the envelope, to expand beyond our boundaries and become better is a vital part of our evolving nature much like rebellion is a phase all adolescents experience while growing up. Art cars, theme camps and participants are a testament to that vast imagination and voracious appetite for adventure that humans share. In fact, it’s probably a key reason that with every passing year people come together in the Great Circle brandishing mankinds oldest invention in continuously novel and creative ways. They’re always looking to represent themselves with respect for the past and a spin on the new. It’s also the reason that we are inspired by fire performers or anyone who dares to reach beyond, to that next level. They teach us to reach higher. And they ultimately teach us that in the knowledge of another, we can somehow come to know a better version of ourselves.